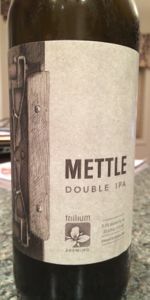 In the spirit of tenacity and camaraderie, Mettle was first created to highlight the milestone of our inaugural year as a brewery. With the intense dry-hop duo of Amarillo and Citra, this medium-bodied Double IPA beckons with aromatics of pineapple, mango, orange, and a hoppy dankness. A fusion of orange, melon, light pineapple, and a subtle pithiness round out the palate with a smooth, pillowy mouthfeel. We continue to brew Mettle in recognition of our devoted following of hopheads that have supported us from the very beginning. The beer comes in a deep gold to pale amber color, fluffy white head, rich and hazy. The aroma offers earthy, green weed dank qualities, pine sap, surrounded by dried citrus peel, tangerine/orange peel, with a surrounding peach and apricot. The flavor transitions onto white grape, hints of sweet white wine, dried mango, pineapple, unripen mango, concentrated dried orange peel, a sugar coated light biscuity malt, onto a medium pithy bitterness while the beer dries out. The mouthfeel is chewy and medium plus. Great DIPA with the classic Trillium aroma that makes you feel like you've stepped into the brewery. Dank, citrusy smell bursts forth from the bottle. Taste of unripened mango, pineapple, orange peels and sweet malt. The malt is actually the sweetest I've tasted from any Trillium beer. Strong alcohol heat envelops the mouth; not off-putting but it makes its presence well known. Extremely bitter. L: Poured from a can a nice hazy yellow. Orange tinge. Quite expected and to style. S: Definitely citrus, probably orange. There's sort of a dark fruit component that's really working for me, or maybe it's wood. T: First sensation is orange juice. It's incredibly smooth for a double IPA. Tastes like overripe oranges. Best of class so far. F: So delicate for a double. You'd never suspect the 8.4%. O: Incredible. I can't believe a double IPA is this juicy and drinkable. Could be dangerous. I really like this beer, in spite of what I'm about to write. Can dated 10/24/16, so only 2 weeks old. The nose is off-putting, full of funk with hints of redemption. The beer is fairly cloudy, a good omen. Taste is immediate gratification, I get mostly lemon with light dank, together with background palette of mixed flavors over a sweet malt background. Texture, body is wonderful, On the lighter end of a DIPA. The finish is not as dry as some that proclaim a dry finish. High marks with subtraction for the nose and dank, which I could use less of. Lots of grapefruit here. The nose is so pungent and the flavor barely leaves any bitterness behind. It has that particular Trillium flavor all over. Grassy. A - hazy golden yellow orange glow....cloudy beer just how I like them. S - Huge citrus orange, tangerine and peach nose with some bitter orange peel.....and dankness.....another favorite of mine. T - same as nose but the bitterness kicks in as well but nothing too over the top. A remarkably well balanced beer that is very easy to drink for an 8.4% beer. M - not too overly carbonated, very juicy with dryness and hop bitters that linger on the back end. O - Like the other Trillium beers I've tried this is another grand slam. Glad this is right here in Boston. Poured from can, obtained less than 2 weeks from brewery. My first experience with trillium and I was excited to pop the trillium cherry! A: less opaque than a treehouse, small floaties in stasis. I can't tell if it's orange or yellow but a pleasant blend of both. S: quite pleasant with citrus but not in your face. Probably my least favorite of the Trillium IPA, DIPA and APAs but still very good!